Crafting Confessions: 'tis the Season! Love these colors together, beautiful card! This is super adorable! I love the text on the snowflake!! SO cute!! The color combo is fab too! This is so pretty Aimes.Love the colors and the snowflake. Hope to play along this challenge. Wish had more hours in a day...lol. Beautiful card Aimes - I loved your original too! The snowflake with the shimmery text is such a fab idea, and looks amazing! Gorgeous card - can't decide which version I prefer though - they're both stunning. Love it Aimes, great Christmas card. Love the snowflake Aimes. 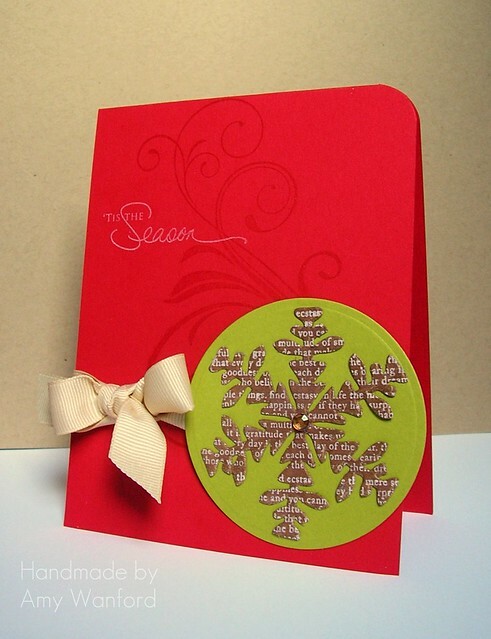 Great layout for your Christmas cards - simple to reproduce and lovely. These are beautiful..I was addressing some of my cards last night and laughing as I added so many stamps...thinking I need to mail them myself so my husband doesn't see all the postage - yikes!! It's so beautiful! Love the big snowflake with white text! Absolutely gorgeous Aimes! Love that snowflake! Oh, just love what you've done with this, its perfect!!! Awesome snowflake! I have a feeling you'll be one of the Trigger Targets for this one, my dear. I think this is lovely, and agree with the postage costs! Great set of colors. Very nice, Love the snowflake with the text on it. It is definitely feeling like winter over here too. Love this Amy! Wish I could see that glitter, but I trust ya! Stay safe while driving in that ice! Oh, this is soooo pretty, Amy! I love the text within the snowflake. Gorgeous card! Oh how adorable! Totally love what you did with the inspiration and turned it into white text on your snowflake! So neat! Fantabulous Christmas card, my friend! Hope you are staying warm & cozy with all that SNOW! Love your take on the gingerbread snowflake and how you have designed yours on that fabulous card! Maybe instead of the ribbon, add a thick strip of Score-tape and glitter it up so it fits through the mail better. Save the ribbon ones for hand giving. Enjoy the season! woohooo! beautiful card. love the bold colours. you must be very excited for this chrismas,wish you a very warm and beautiful christmas. wonderful card Aimes, love the bow!! Great layout! Love your snowflake!